Thanks so much for the update(s). … I heard a segment yesterday about “conspiracy theories,” and I guess it’s obvious that “fake news,” whatever that really means, is a 2019 reality. Much less (?) awful than influenza as a mass killer back in 1919 or so, but still awfully pernicious. My point – am I being unduly cynical in thinking that maybe BBP has access to ears (and “brains”) at DOT, City Hall, etc. that the BHA somehow does NOT? … NO evidence, I admit, but one would think that BBP would have “pushed back” hard on the BHA plan if they thought it had legs! Many, many more people use BBP than live in the gilded mansions of Columbia Heights. It’s time to organize now and keep the highway out of the park! The health of our kids shouldn’t be traded for an easier political path. The park is for all!! “Gilded mansions? ?” Glad to see that the CP/USA is still functioning. “The kids” – nobody loves them more than I do – REALLY – can play elsewhere. Until 10 years ago, they HAD TO. The residents of Brooklyn Heights – thousands and thousands of them really do NOT have the option of living somewhere else for 10 years. This much I know. If this boils down to a “public health” decision, Brooklyn Heights will be “spared.” Only if it comes down to “What’s best for Pierhouse residents?” will the Park be spared and Brooklyn Heights gassed. More children use the 2 playgrounds that abut the promenade than use BBP, and now that the tsars that rule BBP have axed the pool, the disparity will be even higher – year round! Just as labor unions are routinely used to help make billions for REAL billionaires – most recently, trying to force Amazon on a city better off with it and Wal-Mart elsewhere – watch how one-issue “greens” will be used to support a bogus “save the park” campaign – it’s not remotely “threatened!” – even as kids whose parents chose to live in Brooklyn Heights develop asthma. This isn’t NIMBY-ism – it’s “Not over my dead or poisoned body”-ism. False comparison.The highway — AS IT’S BUILT NOW — is in unhealthy proximity to much of the neighborhood, not just Columbia Heights. Everything west of Hicks Street, and virtually all of the north Heights, is within 500 feet (common measure of unhealthy proximity) to the BQE. PS8 and its 500+ kids are within 100 feet. This population of the BQE-adjacent area, who are exposed to it every day, is greater than the average daily visitor count to BBP (who are visiting, not living, there). 500 feet is the distance to the west of the BQE that encompasses much (but not all) of the park (and of course 1BBP and Pierhouse). 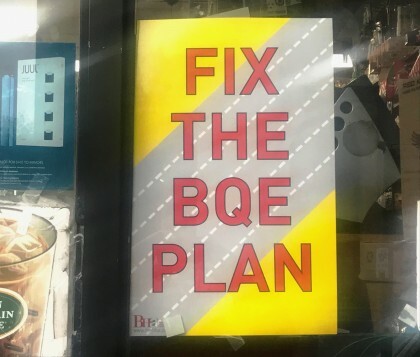 So let’s compare apples to apples – it’s not “the Park” vs “Columbia Heights.” That’s a nice soundbite but not a reasonable analysis of who will actually bear the brunt of BQE construction. Yes, I’m sure you’re an under-privileged basketball-playing street urchin, not a Pierhouse owner! Talk about Gilded mansions… Most owned by absentee Russian and Chinese money-launderers. You and your comrades can stay at your dachas for a couple years. “The BHA’s Better Alternative” Problem is, you have no quantifiable proof of you assertion. Your first sentence is demonstrably not true. The BBP section in front of the Promenade is often empty while our neighborhood has thousands of living and breathing people here 24 hours a day. Even the BHA parallel highway plan would be further from the sports facilities than the 6-lane hi-way would be from our neighborhood. And btw I live in a 1000 sq ft pre-war apt near the Promenade, not a gilded mansion.